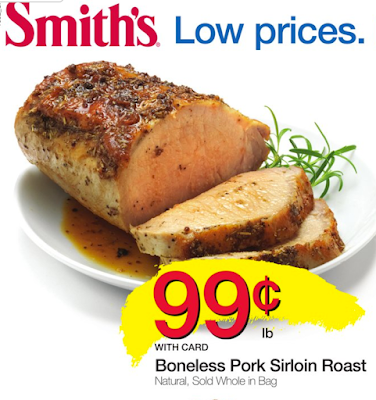 Before the Smith’s deal is over tomorrow, I wanted to highlight a super great price they are having on pork roasts. For only $0.99/lb. this is a great time to stock your freezers! Pork roasts make a simple meal that can easily be cooked in your slow cooker. If you haven’t tried this recipe for Hawaiian BBQ Pulled Pork Sandwiches, you’re going to love them! All of the ingredients are on sale this week, so it’s a great time to add this recipe to your weekly meal plan 😉 Login to Deals to Meals to see the best grocery deals in your area. For the pork, place the pork fat side down in a crock pot. Sprinkle with all of the pork seasonings and rub into the meat as best you can. Put the lid on and let the pork cook on low heat for 5-8 hours, depending how large the roast is. Once the roast is tender and cooked, remove from the pan, and shred the pork into pieces. Drain the juices from the crock pot and discard. Add the shredded pork back to the crock pot and let rest until the other parts of the recipe are ready. While the pork is cooking, prepare the other aspects to the recipe as follows. Sweet Chile Sauce: Bring the vinegar, sugar, crushed red pepper, salt and garlic to a boil and cook until the sugar and salt dissolve. Simmer for 5 to 10 minutes, and then set aside until the pork is ready. Right before you toss in the pork, remove the smashed garlic cloves. Once the sauce is done, pour it over the shredded pork and toss to coat. For the salsa: Preheat a grill pan or grill over high heat. Rub the grill with a bit of oil and grill each side of the pineapple slices until dark grill marks appear, 3 to 5 minutes a side. Roughly chop the pineapple and add it to a bowl with the cilantro, ginger, lime juice, jalapeno and onions. Season with salt and pepper. For the sandwich build: Place ample quantities of pork on the bottom bun and top with Grilled Pineapple Relish. Drizzle with your favorite BBQ sauce.